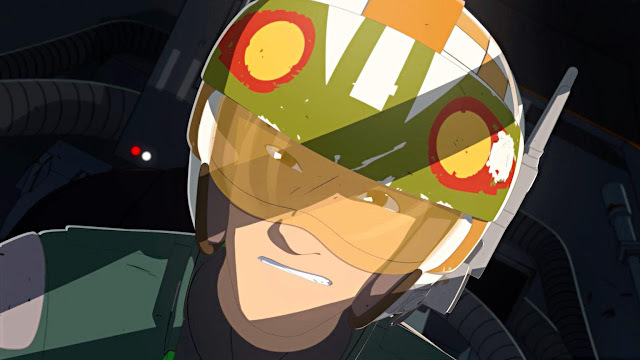 "Star Wars Resistance," a new animated series that takes place prior to the events of "The Force Awakens," takes flight with a one-hour premiere SUNDAY, OCTOBER 7 (10:00 p.m. EDT/PDT) on Disney Channel, DisneyNOW and Disney Channel VOD, with subsequent airings on Disney XD. In the one-hour premiere titled "The Recruit," Poe and BB-8 assign newly-appointed spy Kaz to the Colossus, a massive aircraft re-fueling platform on an outer rim water planet, home to colorful new aliens, droids and creatures. While undercover, Kaz works as a mechanic and lives with Poe's old friend Yeager -- a veteran pilot who operates a starship repair shop run by his crew: Tam, Neeku and their old battered astromech droid, Bucket. Kaz soon finds himself in over his head with his newfound friend BB-8 as he'll have to compete in dangerous sky races, keep his mission a secret from his newfound family, and avoid the danger of the First Order. The voice cast includes: Christopher Sean ("Days of Our Lives") as Kazuda Xiono; Suzie McGrath ("East Enders") as Tam Ryvora; Scott Lawrence ("Legion") as Jarek Yeager; Myrna Velasco ("Elena of Avalor") as Torra Doza; Josh Brener ("Silicon Valley") as Neeku Vozo; Donald Faison ("Scrubs") as Hype Fazon; Jim Rash ("Community") and Bobby Moynihan ("DuckTales") as Flix and Orka, respectively; Oscar Isaac ("Star Wars: The Last Jedi") as Poe Dameron, Gwendoline Christie ("Game of Thrones") as Captain Phasma and Rachel Butera ("Tammy's Tiny Tea Time") as General Leia Organa.